Bahamian track fans got something to rejoice about on Sunday (23) when their mixed-gender 4x400m team mined gold at the third renewal of the World Relays in that country’s capital city Nassau. It was the first time that the Bahamians won gold in the event since it began on their own turf in 2014. Introduced for the first time at this year’s edition and seemed tailor-made for the host country, the 4x400m race featured two males and two females on each team, who may run any gender on any leg. That means men could end up running against women, or one or more legs could be run by the same gender. Winning, therefore, comes down to strategy and bragging rights on some legs. The host were primed for this event and they were quite confident that they would take that race based on the fire power they had. Bahamas went in with two of the fastest quarter-milers in the world this year and one member of the 2012 Olympic gold-medal squad. And so they employed the strategy of front-loading their lineup with world leading 400m man Steven Gardiner handing to defending Olympic champion Shaunae Miller-Uibo to Anthonique Strachan to Michael Mathieu, who copped the 2012 Olympic relay gold. Gardiner ran a solid leg against his all-male rivals to give Miller-Uibo the baton in the lead. Running against all women, she opened up a 40-meter gap on the fierce battle behind her for second to send Strachan on her way. 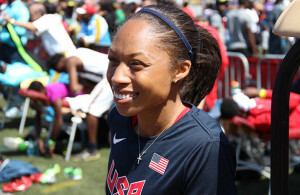 But Strachan lost that lead as the US male overtook her about 140 meters from home. The final turning point came at the last exchange; for the first time in the race, women were running against men. The pendulum soon shifted in favor of Bahamas, after the US runner Paul Dedewo in the lead passed the baton to female Claudia Francis who took off some 20 meters ahead for the final leg. It was at this point that the strategy worked solidly; for Strachan handed over to her male teammate, Mathieu, who immediately stepped on the gas to reel in Francis and go by her just before the homestretch, driving hard to the line leaving Francis for the silver about 30 meters out. The crowd went wild as they witnessed the host country break the drought and hear their national anthem to bring the curtain down to end the 2017 event.